I woke with the image of a giant Jack Kirby style serpent villain arbitrating an argument between two corporate entities. 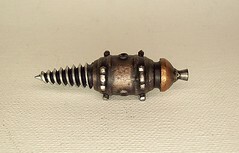 The serpent had a head like a giant auger screw, like the one used to bore to the center of the earth in that 70's movie. The boring lizard men myth with the corporate authority connection I thought was interesting. 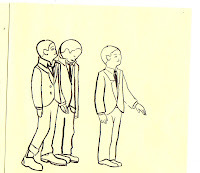 There was also a little bit of a Crispin Glover "Ray Catching" aesthetic to the way I visualized the final drawing. It came out more like Hanna Barbara, and that hippo with the pith helmet. I think this illustration is loosely related to the Haiti scene. The Hippo is also called the huricane hollerer. There have been more than one reference in popular media of the Haitian earthquake to hurricane Katrina in New Orleans. The zombie phenomenon is represented here with the boy office worker. 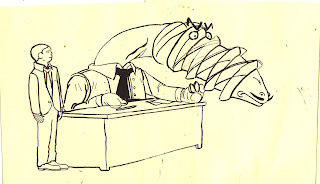 There is also a reference to the secretaries in the movie adaptation of Kafkas story about the castle. References to the Arbiter in the game Halo do not escape me either, perhaps an altruistic chaotic good, Paladin of scale and free market.